January 22, 1909. Tifton, Georgia. "Family working in the Tifton Cotton Mill. Mrs. A.J. Young works in mill and at home. Nell (oldest girl) alternates in mill with mother. Mammy (next girl) runs 2 sides. Mary (next) runs 1½ sides. Elic (oldest boy) works regularly. Eddie (next girl) helps in mill, sticks on bobbins. Four smallest children not working yet. The mother said she earns $4.50 a week and all the children earn $4.50 a week. Husband died and left her with 11 children. Two of them went off and got married. The family left the farm two years ago to work in the mill." Photo and caption by Lewis Wickes Hine. View full size. Submitted by alexd on Tue, 09/11/2012 - 1:25pm. Submitted by CarolMcC on Tue, 10/11/2011 - 3:15pm. Once again, Mr. Manning, you have left me speechless. All I can say, is a very inadequate "thank you". The Youngs: 1909. Entire story complete. Submitted by joemanning on Thu, 12/31/2015 - 9:07am. Submitted by Dbell on Sat, 09/03/2011 - 2:15pm. Quite right! In these days, we don't see this type of orphanage in the US (or really, any at all.) But in many countries, they are still State run board-and-care homes for families experiencing hard times. Only those children whose parents have given up their rights (or had them removed judicially) are available for adoption. We adopted two little girls from a Russian home in 1998 and 1999 (where all the children had received excellent care and attention, BTW.) Noelani mentions the one little boy in particular. It is truly heart-breaking to visit an orphanage like ours, and not be able to bring home ALL of them! We have a photo of three beautiful, smiling little boys, maybe 8-9 years old, in baseball cap, in a line with arms about each other. Could have been any home-grown group of pals, much like some of Hine's newsboys here on Shorpy. Submitted by Jonathan Morse on Sat, 09/03/2011 - 6:02am. For both its words and its pictures, James Agee's and Walker Evans's "Let Us Now Praise Famous Men" (1940) is a classic. But there are also two "Where are they now?" sequels to this book about three poor families living in the cotton economy of the Depression-era South. One is Howell Raines's article "Let Us Now Revisit Famous Folk" in the New York Times Magazine, May 25, 1980; the other is Dale Maharidge's and Michael Williamson's book "And Their Children After Them: The Legacy of 'Let Us Now Praise Famous Men': James Agee, Walker Evans, and the Rise and Fall of Cotton in the South" (Pantheon, 1989). Good luck trying to see the photographs that accompany Raines's article, though. They've been deleted from the online version for copyright reasons, the paper originals are mostly gone now, and (in my library, at least) the microfilm copy is fast deteriorating. If you want one more example of the tragedy of current copyright law, there it is. Submitted by noelani on Sat, 09/03/2011 - 2:17pm. It breaks my heart to think that this woman was in such a desperate situation that she had to give up her beautiful children. The little guy with his hands in his pockets especially touches my heart! The same situation faced many parents in Romania, only 20 years ago. The German social worker in charge of adoptions in the area we were living in at the time told us that she was planning a trip to take some of the Americans on our base to find children to adopt from a Romanian orphanage. We didn't end up going, but others from our base did. They had gone thinking that any child who was in an orphanage would be free for adoption, but that was not the case. Many of the parents of the children had put them there out of desperation, but hoped to one day be able to take them home. Things did eventually improve in Romania so, hopefully, most of those parents were able to take back their children. I'm so sorry that Mrs. Young did not have that opportunity. Submitted by Jdy on Fri, 09/02/2011 - 12:33am. My mother picked cotton and also worked as a migrant worker in California when she was a teenager. She and my grandmother always said cotton was the worst--backbreaking labor and bolls that ripped inexperienced hands to shreds. I grew up with very little economically, but thank God I was taught to be grateful for everything I had and for the time in which I was born. I wonder how many of us could currently survive those times and circumstances and with so much courage and grace? I look forward to hearing the rest of the story. As a mother and grandmother, I can only try to imagine the depth of Mrs. Jones' sorrow. What incredible love and amazing strength she demonstrated when she allowed her babies to have second chances at better lives. Truly a remarkable human being. Submitted by Berean on Thu, 09/01/2011 - 8:39pm. Great work, Dave. The comments here, all 1,000 or so words, are worthy of the picture. History lives. Submitted by Mudhooks on Thu, 09/01/2011 - 6:39pm. Orphanages were not only for children to be adopted. Many orphanages were places where children could be placed until the parent, more often a widowed mother, could place their child until she found her footing. My half-brother and sister were placed in an orphanage several times during their childhood when their mother couldn't financially cope and my (by then estranged) father was unable or unwilling to support them. I thank my lucky stars MY mother always had steady work. Submitted by Mudhooks on Thu, 09/01/2011 - 6:33pm. People seem to think that people had a choice about whether or not they had children. They didn't. Birth control wasn't an option for just about anyone in those days, even the wealthy. And the wealthy had the luxury of having separate bedrooms. Sure they could abstain (abstention being the modern rockinghorse of those who seem to things that marital relations are a prerogative of those with money). Humans have the sincere (and often vain) hope that eventually life would improve. There was also the hope that some of the children would survive to adulthood and eventually take care of their parents. A wish about to be granted? Submitted by Larc on Thu, 09/01/2011 - 3:51pm. When I see pictures at Shorpy, I often wonder what might have happened to the people in them and wish I could learn more. Especially with shots like this one, I want to believe at least some of the kids might have gone on to better things and even happy lives. Now it appears we might get many of our questions answered, at least about this family. 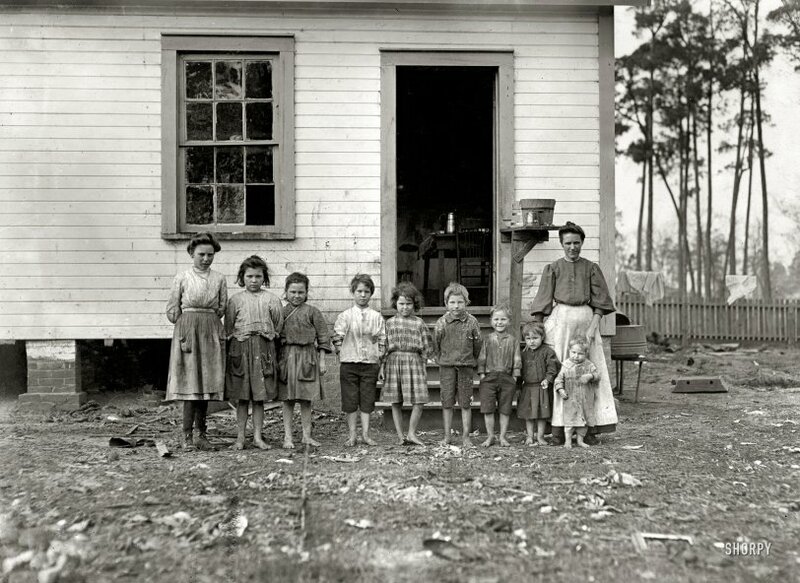 According to info at sevensteeples (Joe Manning's site), the kids in this pic are (L to R) Mell, Mattie, Mary, Alex, Eddie Lou, Elzy, Seaborn, Elizabeth and Jesse (boy). Submitted by Louise on Thu, 09/01/2011 - 1:55pm. Thirty years later, the children that had to be placed into an orphanage, the family split up, were all voters. They remembered that event. The original purpose of Social Security was to support the indigent: the elderly, widows and their children. If each child had received a grant until the age of 18, the family would have been able to hold itself together. We truly have forgotten the grinding poverty of the early 20th Century. The grandchildren and great-grandchildren of Mrs A. J. Young probably have little idea of what happened to their family - or what it meant. The person I wonder about is Mrs. Young. What must breaking up her family have done to her! She looks to have been a proud and loving mother - look at the way her hands rest on the two youngest. Joe Manning, thank yyou for letting us know what happened to this family. All America should learn their story. Submitted by Savannah on Thu, 09/01/2011 - 11:24am. I cannot WAIT to receive the link to your article Joe Manning. Dave, if possible, it would be great if you wouldn't mind highlighting it in its own post so we catch it. What a fascinating, incredible story--and so heartbreaking. Imagine, just three months after this picture was taken, this family was shattered. Children sent to different homes, losing touch with their mother and siblings. Imagine the psychological trauma they all, especially Mom, went though. Trauma that likely was never discussed, but infiltrated their lives on a daily basis. I work in the field of health disparities and learned that individuals of low Socioeconomic Status (SES) have a different type of stress than their counterparts. This difference is incredibly displayed in the two pictures Nemesis Grey posted. There's chronic stress experienced only by low SES individuals (persistent, never ending stress that occurs when individuals are unable to obtain long-term security for the basic items required for survival), and intermediate stress experienced by mid- to high-SES individuals (stress with definite endpoints that at times, can even reap rewards, e.g. work deadlines, getting children to day care on time, and even sicknesses (since medical care is one less stress for those who are insured)). Submitted by Walter on Thu, 09/01/2011 - 11:04am. Submitted by Nemesis Grey on Thu, 09/01/2011 - 9:28am. So, for curiosity's sake, when I viewed this photo I did a quick google search on Mrs. A. J. Young. There is another photo of Mr. Hine's that seems to appear very often online. While viewing it, I found it interesting and remarkable how eerily similar it was to the "1964 diner" photo posted here on Shorpy recently, the subjects faces.. so similar, but their expressions clearly mark the particulars of their time and experience. They almost appear as the same people experiencing two different realities. Submitted by Mr Mel on Thu, 09/01/2011 - 8:06am. The fact that most of the children wound up in an orphanage, where they were put up for adoption, shows that the family really did not survive. If you were dirt poor at the beginning of the 20th Century you didn't have a chance. The husband who had died, and I'm hypothesizing here, possibly died in a work accident, or from a disease that he couldn't afford to be properly treated for or just plain worked himself to death. Submitted by fanhead on Thu, 09/01/2011 - 7:49am. It's a shame the old man died when he did. Looks like they were going for the record. Submitted by Maniak Productions on Thu, 09/01/2011 - 6:25am. Dave, I've always been curious of something. Are the comments on the backs of the pictures, or are they a separate document or journal? Its always the same brief details he provides regarding hours worked, wages, living conditions, as well as the numerous times he mentions a child laborer that he suspects is lying about his age in order to get a job. Submitted by SlamDance_Karma on Thu, 09/01/2011 - 5:29am. My mom's family did some sharecropping (cotton) while she was growing up in Dallas Georgia. This was in the 50s. From the stories she's told, everything associated with the cotton farming lifestyle was extremely hard. And it's funny this pic would be posted today, as just yesterday I finished reading the novel "A Painted House," by John Grisham. It goes into great detail about the lifestyles and hardships of cotton growers/sharecroppers/any and everything to do with the lifestyle. As I so often say here, we just don't know how good we have it today. Even something as simple as a Coca Cola was a luxury to these people. This is yet another heart-breaking photo here. Submitted by joemanning on Thu, 09/01/2011 - 4:25am. 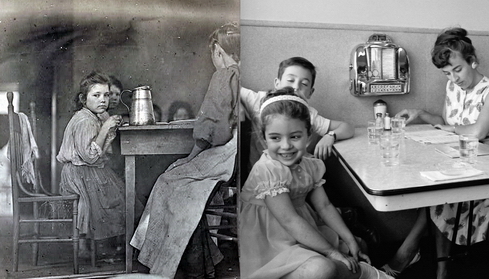 This is Joe Manning, of the Lewis Hine Project. For more than four years, I tried to identify the mother and children in this family...giving up, starting again, giving up, etc. I posted the photo on my website, hoping that someone would see it and know who this family was. On January 24, 2011, almost exactly 102 years since the date of this photo (January 22), I received the following email: “The family of Mrs. A.J. Young of Tifton, Ga. is a picture of my grandmother and great-grandmother's family. My mother knows more information.” Several hours later, I talked to both the writer of the email, and her mother, got a few more facts (they didn’t know a lot), and spent the rest of the day searching census and death records on the Internet. After eight more months of research, and interviews with numerous descendants, I have assembled the incredible story of this family, and I am close to posting the entire story on my website. I was able to track down the story of the mother, every child in the photograph, the two children who had recently married and are not in the photo, and the husband/father who had died. Exactly three months after Hine encountered this family, Mrs. Young, in desperation, placed the seven youngest children in an orphanage, and within several years, most had been adopted and lost contact with one another. One hundred years later, the descendants now know what happened to all of them. I’ll notify Shorpy when the story is posted.